I have never seen a man run as fast as he does, I still cannot forget that goal against England where he ran passed English defenders behind him and even the Queen of England stood up and applauded. With 14 world cup goals already in his belt he is surely the man to watch out for in the upcoming 2014 world cup. Go Klose go. The work of Pistis Sophia is in more accordance with Ophites rather than with Valentinianism. Scholars have rightly abandoned the hypothesis that Pistis Sophia might be a Valentinian material. Why do I think it is not a Valentinian material? "The Logos uses him(Yaldabaoth or Demiurge) as a hand, to beautify and work on the things below, and he uses him as a mouth, to say the things which will be prophesied." The role of demiurge in Valentinianism is quite unique among the gnostic sects, here he is not seen as a demon or as an oppressor of Sophia instead he is seen as an ignorant God who doesn't know about the higher pleromic Aeons. Sophia uses him secretly to sow the spiritual seed in all human beings, that's why this world even though its not real is very important, this is the reason why the Valentinians had such a positive attitude towards pro-creation, marriage and in creation overall. With all being said Pistis Sophia is an extraordinary work and a must read for all those who have a love for the gnosis of the heart. The entire Basilidian system and the more refined Valentinian system is Brahmanical in its origin. Mosheim, the first historian of the church long maintained that the roots of Christian Gnosticism is not to be found in the religion of the Greeks or either in the Zoroastrianism of the Persians instead Christian Gnosticism is derived in its entirety from the religion of the Brahmans. When one studies the ontology of the Ineffable Father of these two religions there is no doubt in my mind that they both are expressing the same Ineffable Father. In both of these traditions the totality of divine powers or Aeons resided in the womb of Father from the very beginning of creation. "Hiranyagarbha - One who dwells in the womb (garbha) of the world (Hiranya). The Hiraṇyagarbha Sūkta of the Ṛkveda declares that God manifested Himself in the beginning as the Creator of the Universe, encompassing all things, including everything within Himself, the collective totality, as it were, of the whole of creation, animating it as the Supreme Intelligence." "On the other hand, the treatise also contains elements that point toward an early phase of Valentinian theology, like the theory that the aeons initially existed inside the Father as in a womb--a theory also attested for Valentinus himself (Tertullian, Against the Valentinians 4.3) and found in the Gospel of Truth." Abraxas is the Holy Father of the gnostics and this unique image of him riding a chariot clearly proves that he is a supreme deity belonging to the solar pantheon. Carl Jung is right, Abraxas is a god whom humanity have forgotten. Don't be carried away by the symbolism of the Basilidians I strongly doubt that the symbolism has anything to do with the Ineffable Father's ontology or his appearances. The irony is, what is orthodoxy in one part of the world is totally heretical on the other side. Its a knowledge which the west have rejected. Many schools of thought emerged in India while interpreting the Vedas, Upanishads, Aranyakas, Brahmanas, Tantras and other texts. 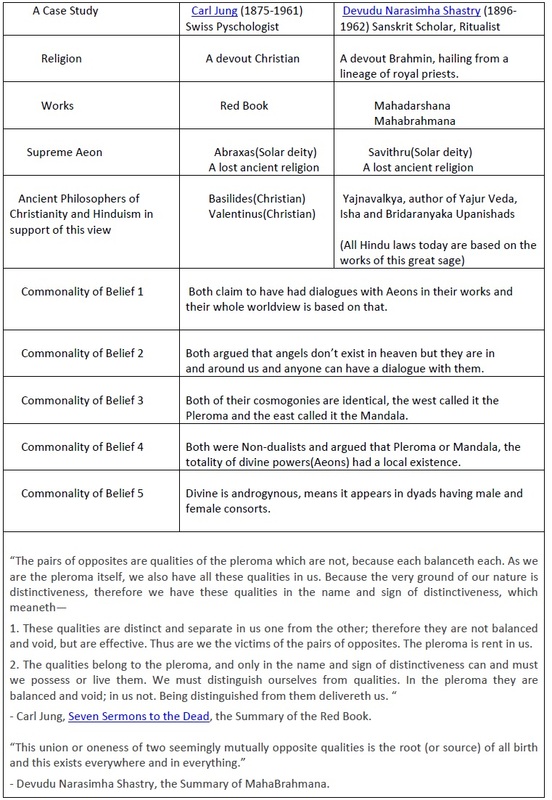 It is very important to understand the philosophical differences in each of these different philosophical schools. What I find is that many meta-physicians, scholars and philosophers put all these philosophical schools into one umbrella and either try to use these great philosophical systems as support of their theories or use it to refute other philosophical systems without giving any sensitivity to their philosophical differences with in the oriental religions. As I said before it was Shankara who took us out from the repeated onslaught of Buddhist philosophy and their hatredness towards Vedic Brahmanism and upheld the philosophical truth of Non-duality (Advaita). "No further special discussion is required. From whatever points of view the Buddhist systems are tested with regard to their plausibility, they cave in on all sides, like the walls of a well dug in sandy soil. [Buddhist philosophy] has, in fact, no foundation whatever to rest upon, and thus it is foolish to adopt it as a guide in the practical concerns of life. Moreover, the Buddha,3 by presenting three mutually contradictory systems of philosophy — teaching respectively the reality of the external world, the reality of consciousness-only, and general emptiness — has himself made it clear either that he was a man given to making incoherent assertions, or else that hatred of all beings moved him to propound absurd doctrines that would thoroughly confuse all who might take him seriously. Thus, the Buddha's doctrine must be entirely disregarded by all those who have a regard for their own happiness." ". . . In order to know Brahman, we must meet the following conditions: (1) We must recognize the distinction between what is eternal and what is non-eternal; (2) we must renounce all desire to enjoy the fruits of our actions, both here and hereafter; and (3) we must acquire tranquility, self-restraint, freedom from religious ceremonies, patience in suffering, attention and concentration of the mind, faith, and the desire for final release (moksha). If these conditions are met, we may engage in the inquiry into Brahman and come to know it, but not otherwise . . . . The complete comprehension of Brahman is the highest good since it destroys ignorance, the root of all evil and the seed of Samsara [the beginningless and unending cosmic cycle of becoming, being, and dissolving]." What is worthy of discussion is the condition (2) - "we must renounce all desire to enjoy the fruits of our actions, both here and hereafter;"
It is worthy because this is what Saint Paul is saying in his Romans that the pneumatic gentiles are apart from the works of the law and that they receive redemption not by human effort but they are preordained to be saved by the grace of Christ. Where then is boasting? is what Saint Paul asks in his Romans which means the elect should renounce all boasting of his works and his knowledge as everything he has done and received is due to the grace of the Father, Jesus Christ and not by his own effort. This is the truth which so many people fail to understand and this is what keeps them away from the truth. The truth that we are not acting alone but indirectly guided by Sophia in all our deeds and actions. If we are not doing any works all by our own then why should we take pride for our works? The truth is, you are not this body, you are not the sense organs that animates this body, you are not the mind that controls the sense organs and is in mediator with the sense organs and the intellect, you are not this intellect which controls the mind, you are not the ego (God) who sits behind the intellect and controls all your deeds, the Self(The One) is greater than all of these and is beyond the pleroma of God and that Self (The One) is nothing but who we all are. It is the place where individuality dies and unity blossoms. I don't know what it is or how is it like to be in there, I only have paroksha gnana (scriptural knowledge) and not prathakshya gnana (experiential knowledge). O Thou, who art the nourisher, the solitary traveller, the controller, the acquirer, the son of Prajapati, do remove Thy rays, do gather up thy dazzle. I shall behold that form of Thine, which is the most benign. I am that very person that is yonder (in the sun). Here the seer rishi is asking the Father to remove his dazzling light rays that is emanating from his body (these rays are nothing but the Aeons of the Pleroma which is rent in his womb from the very beginning), so that he can see his true Self and become one with it. We can speak up to the Pleroma of God but not beyond it. - James Hillman, polytheistic myth as psychology. As some one who has studied molecular biology I know how absurd is the claim that gods reside in our bodies. But when we view science as only the mere appearances of phenomena and religion as the noumena that exists independent of us the claim that gods reside in our bodies doesn't appear to be as absurd as it seems at first. Theurgy, sacred words and alchemy indeed works if you press the right button at the right time. How is it that people can make an ascent to the third heaven? How is it that by mere recital of the sacred words one achieves such a high efficacy over nature? All this is possible not by magic but by understanding the gods that govern our bodies and the cosmos. This is the view which Neo-platonism of Iamblichus, Vedas, Gnostic Christianity, Taoism and Buddhism wants us to embrace. Carl Jung, the Christian gnostic figured out his theory of individuation based on his extensive studies on these religions. "Jung's work on himself and his patients convinced him that life has a spiritual purpose beyond material goals. Our main task, he believed, is to discover and fulfill our deep innate potential. Based on his study of Christianity, Hinduism, Buddhism, Gnosticism, Taoism, and other traditions, Jung believed that this journey of transformation, which he called individuation, is at the mystical heart of all religions. It is a journey to meet the self and at the same time to meet the Divine. Unlike Freud's objectivist worldview, Jung's pantheism may have led him to believe that spiritual experience was essential to our well-being, as he specifically identifies individual human life with the universe as a whole. Jung's ideas on religion gave a counterbalance to the Freudian scepticism on religion. 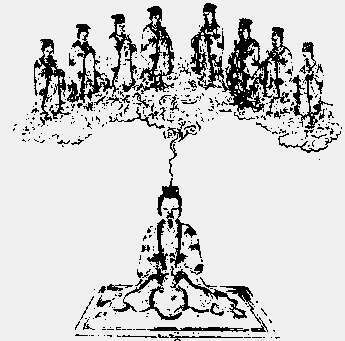 Jung's idea of religion as a practical road to individuation has been quite popular, and is still treated in modern textbooks on the psychology of religion, though his ideas have also been criticized"
If anyone becomes a son of the bridal chamber, he will receive the light. If anyone does not receive it while he is here, he will not be able to receive it in the other place. He who will receive that light will not be seen, nor can he be detained. And none shall be able to torment a person like this, even while he dwells in the world. And again when he leaves the world, he has already received the truth in the images. The world has become the Aeon (eternal realm), for the Aeon is fullness for him. This is the way it is: it is revealed to him alone, not hidden in the darkness and the night, but hidden in a perfect day and a holy light. I must admit that this is where the gnostic and the vedic thought reaches its ultimate climax, the whole macrocosm (cosmos) is reduced to a single deity in whom all the fullness dwells and this is the process of becoming one with the Father and his cosmos, only then you will know that you are none other than unity itself. "People cannot see anything in the real realm unless they become it, if you have seen Christ you have become Christ, if you have seen the spirit you have become the spirit, if you have seen the Father you will become the Father"
No scholar of western hemisphere up to now as understood the secret meaning of the mandala other than Carl Jung, only a gnostic like Carl Jung could have understood it, its quite obvious that for an immature western mind the concept appears completely alien to them. 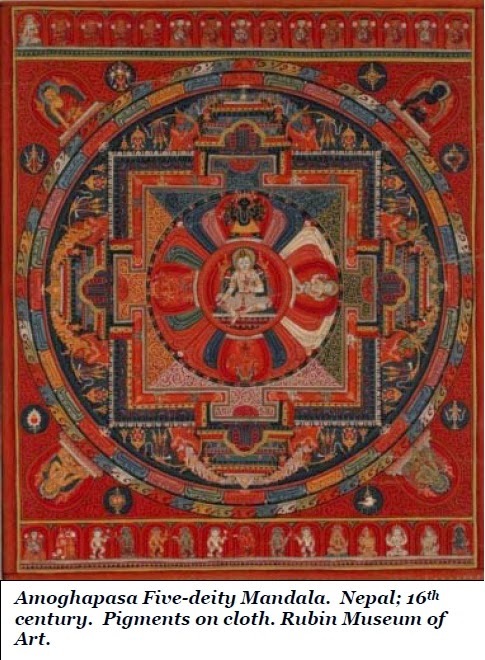 While Tibetan Buddhism and Tantric Hinduism have converted the concept of Mandala into imagery and art, Gnostic Christianity and the Vedic Aryans have preserved the true meaning of the Mandala as the fullness (Pleroma) that dwells in the body of Christ. One doesn't have to make complex diagrams and computer generated 3D models of mandalas to receive redemption. All that one need is a pneumatic heart and a grace of the pneumatic Christ, a beautiful message purported by the greatest apostle Saint Paul, it is indeed a good news. We worship Savithru (Sun God) as the deity who always resides at the center of the savithru mandala whose body is formed by all the Aeons of the Pleroma.